What Should Go in Your Prenuptial Agreement? Protecting your assets during a divorce is almost impossible without a prenuptial agreement. Part of going through a divorce is dividing up a couple’s assets in a fair manner. When you have a prenuptial agreement, you can easily protect a variety of sentimental family heirlooms, other valuables, and money. Discover what assets you can protect with a prenuptial agreement below. Personal Assets- Whether you are protecting your family’s land or wealth, you can have personal assets written into the prenuptial agreement. You can be as detailed as you would like when it comes to the specifics of your agreement. Children’s Inheritance- If you have children from a previous marriage and want them to receive a certain amount of money as their inheritance, you can have it listed in your prenuptial agreement. If you do get a divorce, this money will not be a part of the division of assets in court. Business- As long as you do not own the business with your significant other, you can include your business assets in the prenuptial agreement. If they are a part of the company, they could potentially have the right to some of the business assets. You need to consult with an attorney about your specific situation. 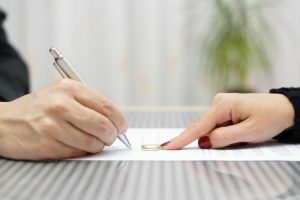 If you have questions about what your prenuptial agreement protects, you can call a Tampa divorce lawyer at (813) 280-2911 today. This entry was posted in Blog and tagged Tampa Divorce Lawyer on June 15, 2018 by HV SEO.